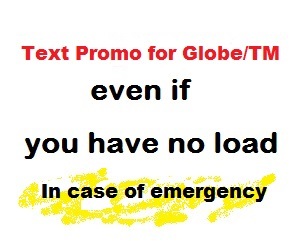 Utang Load TM ~ This globe borrow load promo will let you to borrow load for the text sms messages even without load. All you have to do is to register their promo and start sending sms message even without load of your mobile phone. This globe borrow load promo will let you to borrow load for the text sms messages even without load. All you have to do is to register their promo and start sending sms message even without load of your mobile phone. Many people not watching on the load of their sim card. Big possibility to become empty the balance of their phone without knowing. This is very danger in case of emergency specially if no other phone you can use to contact anywhere on that time. So, how we can avail this promo? Just follow the step below. Simply dial *143# and choose LOAN, then follow the instruction given. That’s it! What happen after? The next time you load of your mobile phone, you will automatically deduct P4 only of load to deduct on your loan. Well, I think this is not much to save your life or the life of your family or friends. I hope you found it useful information about borrowing load for globe and TM even if your phone has no load. If you have any concern about TM and Globe borrow load, then say it in the comment area. Have a blissful life for coming here. Enjoy!